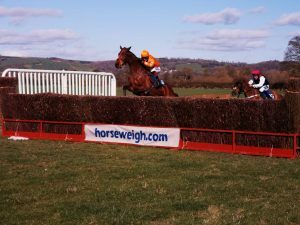 Horse Weigh > Homepage News > Horse Weigh Sponsor Teme Valley & United Pack P2P at Brampton Bryan! Point to Point at Brampton Bryan, Herefordshire. 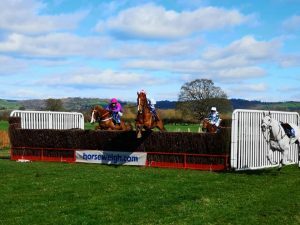 24.03.2019 Horse Weigh visited our sponsored Teme Valley & United Pack Point to Point event at Brampton Bryan. 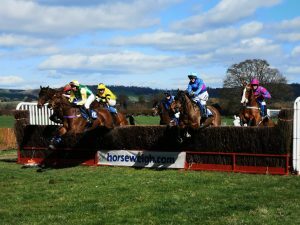 The event attracts up to 100 horses & riders, this exciting point to point horse race is set in the Teme Valley, North Herefordshire. The course at Brampton Bryan is situated between Leintwardine and Knighton on the A4113. A great day had with 6 races completed in total. The 1st race, The Sibson Stakes Confined Race was won by Emtidaad (IRE), ridden well by B. Hobbs, owned by John Chinn (Ross Harriers), trained by Pip Hooley. Pictured below is Emtidaad on the nearside. The 3rd race of the day at 14:30 was the Mixed Open Race where Knight Bachelor was placed 2nd at the last fence but got up to win the race for Alex Edwards & The Random Optimists Partnership. Trained by Philip Rowley from the Wheatland. Pictured below is Knight Bachelor and Alex Edwards. Huge fields today with perfect going.